“We have deployed one relief team to Dehiovita in Kegalle to look for three missing persons. We found two bodies thus far,” Navy Spokesperson, Captain Akram Alavi said. The rains however are predicted to last only until Wednesday, according to the Meteorological Department: “The prevailing weather condition is due to the low pressure system that developed from Bengal to the south-east of Sri Lanka. The system is expected to cross the Tamil Nadu coast on Wednesday morning,” Director General Meteorological Department Lalith Chandrapala said. “After Wednesday, the seasonal intermonsoon rain will prevail in many parts of the country. The weather in the morning will be normal and thunderstorms and rains are expected in the evening,” he said. Colombo, which received 256mm of rain yesterday had several areas in the capital going underwater. According to the Disaster Management Centre (DMC), 3,702 families were affected in the Colombo District as a result of the floods. 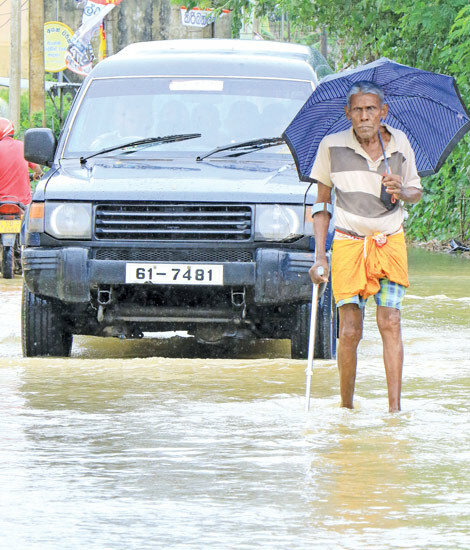 The areas of Ratmalana, Kolonnawa, Colombo, Seethawaka, Maharagama, Thimbirigasyaya, Kotte, Northern and Southern Grandpass, Mattakuliya, Maaligawatte, Bodhiraja Mawatha and Dematagoda were reported affected as a result of the floods. The DMC also warned that the water levels in the Kelaniya River was rising and that this could worsen flooding around the vicinity. The Commissioner also said that the CMC had cleared all the trees that fell on the roads due to strong winds: “There were trees fallen in 21 areas in Colombo and the CMC managed to clear them all,” he said. He further said that the drains were immediately cleaned when the water remained there for longer than expected and that the CMC had also provided food for people displaced by the floods as they waited for the water to recede, to return to their homes. Schools in Colombo as well as around the country were affected by the bad weather. St. Bridget’s Convent in Colombo yesterday shut down due to the area around the school being inaccessible as a result of the floods. Education Minister Akila Viraj Kariyawasam however authorised all zonal and provincial education directors to decide on the closure of schools considering the safety of students and teachers due to the prevailing weather conditions. This decision was made by the Ministry after landslides, floods and strong winds were reported from many parts of the country, Education Ministry Media Secretary, Kalpa Gunarathne said. Principals have been instructed to inform the zonal or provincial education director if there are signs of adverse weather conditions that could affect the progress of the school. The directors will decide on whether to continue school activities or to close the school. The rains have also caused power outages around the country. Ceylon Electricity Board Chairman, Anura Wijepala said that most outages were due to electric lines being broken but said that CEB officers were repairing all lines as soon as they were reported. Katunayake in the meantime recorded the highest rainfall in the island with 262mm of rain. The Katunayake Express Operation Maintenance and Management Division said however that the floods had not affected the Highway or its connecting roads. Three planes on their way to the Bandaranaike International Airport in Katunayake were diverted to the Mahinda Rajapaksa International Airport in Mattala and to Cochin, India: a Jet Air flight from Mumbai and a flight from Kuala Lampur, Malaysia were diverted to Cochin while a Fly Dubai flight was diverted to the Mattala airport. In the aftermath of yesterday’s strong gale in Panadura, the Panadura Divisional Secretariat took account of the damage in the areas of Nalluruwa and Pingwatte. Military Spokesperson Brigadier Jayanath Jayaweera said that 156 army personnel were deployed to the area to repair and rebuild the damaged houses. “We estimate that over 80 houses were damaged by the gale in Nalluruwa and Pingwatte. There have been no deaths, only one house was fully destroyed. As instructed by the President, the Army is currently estimating the cost of the damage and will rebuild them,” an official at the Panadura Divisional Secretariat said. “We have deployed 30 army personnel to the area. There were reports that 2-3 houses in a line house area had collapsed. It has been difficult for us to get there, electrical wires have broken and roads have collapsed,” Brigadier Jayaweera said. A further 30 Navy personnel were deployed to ‘sandbag’ the banks of the Diyawanna Oya as water levels grew and threatened to flood the Parliament. Navy Spokesman Captain Alavi in the meantime said there were 69 Flood Relief Teams on standby for emergencies. The Air Force also played their part, rescuing two fishermen off the coast of Pannipitiya, in Negombo. “We had to cancel three trains, as many of the lines were flooded. The turntable at Maligawatte was also underwater, so we couldn’t turn the trains,” Sri Lanka Railways, Operating Superintendent Wijaya Samarasinghe said. The most affected line was the Puttlam-Colombo line. Trains traveling from Colombo to Puttlam worked only up to Lunuwila, whilst trains from Puttlam to Colombo stopped at Nattandiya. In the South, incessant rains and thunderstorms that prevailed in the Galle district over the weekend left about 500 families destitute, destroyed four houses and partialy damaged nine homes, the Galle Disaster Management Centre said. Several families in Balapitiya, Baddegama, Galle Four Gravets, Yaakkalamulla, Akmeemana and the Hikkaduwa Divisional Secretariat areas were affected severely by the destructive weather conditions, Galle D.M.C. OIC Lieutenant Colonel Najith Edirisinghe said. About 60 families in Balapitiya were affected, while a large number of homes in Piyadigama in Gintota are inundated, as the Gin River overflowed. 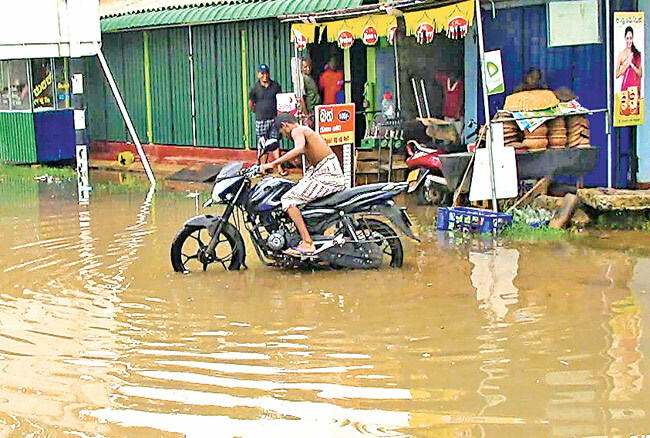 Further, Moragoda Canal in the Galle Four Gravets Divisional Secretariat area flooded, submerging Dangedara, Samagiwatte, Didiswatte and adjacent areas. These areas were under water till last afternoon with no signs of receding. In the meanwhile, owing to the Moragoda Canal overflowing, a number of houses in some regions on the bank, including Kekulan Owita Watte in the Akmeemana Division were flooded. Certain sections of the Southern Expressway Exit, particularly near the Expressway traffic lights at Kaduruduwa, Nugaduwa, also flooded over the last two days. In order to fast-track the recession of floods in Galle, the DMC has made arrangements to widen the mouths of Gin River and the Moragoda Canal yesterday. Galle Acting District Secretary Malani Lokupothagama said that her Secretariat had made arrangements to supply prepared meals and dry rations to those affected by the floods. 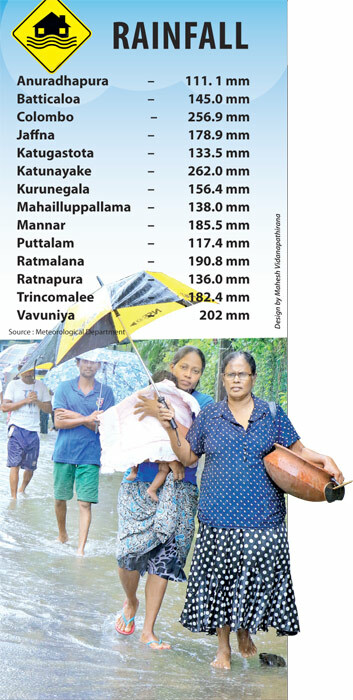 Nearly 172 people in the Kandy District belonging to eight divisional secretariats have been affected by the weather, the Disaster Management Centre in Kandy said. Around 72 families from Uda Palatha, Paspahe Korala, Doluwa, Galagedhara, Gangavata Korale, Kundasala, Gangaehala Korale and Pahathadhumbara divisional secretaries were severely affected. Among them, 17 families consisting 73 members have been moved to safe locations. Of the houses affected, one has been totally destroyed, while thirteen houses have been partially damaged due to the floods, Disaster Management Centre, Additional Director I.A. K. Ranaweera said. However, the water levels that had reached four feet in Akurana had reduced after the Polgolla Dam was opened, he said. The Katugastota-Madawala road was blocked as part of the road collapsed near the Navodaya school. The Doluwa-Gampola road in the Ganegoda area and the Nawalapitiya-Hatton road were also obstructed due to landslides. One house was damaged and nine people were displaced due to a landslide in the Rikillagaskada, Dhidawkumbura area. The areas of Mahaoya, Akkaraipattu, Attalaaichenai, Paalamunai, Olivil, Ninthavur, Sambanthurai, Kaaraithivu, Navidenveli and Thambattai in Ampara district and Kalavanjikudi, Aarayampadi, Eruvil, Siththandi, Thandavan Veli, Kattiruppu, Paasikuda, Vaalechchenai and Mudhalaikudan in the Batticaloa district have been affected by the floods. “Even though many houses and roads are already flooded in many parts of the Eastern province, people have managed to stay in their houses thus far. The people living in the lowlands are the most affected. The agriculture lands are filled with water and if the rain continues the crops will also be damaged,” P.M.M.A Cader from Maruthamunai said. With many fearing for their crops, the Irrigation Department has decided to open the five tanks in Weheragala, Mauwa, Kimbulana Oya, Thambuwa and Deduru Oya: “The Deduru Oya has the highest water levels, so we have opened seven gates there at 10ft each. We had 44,000cm3/s pass through the gates,” Irrigation Department, Additional Director General, Mohan Raja said. With the Deduru Oya opening up, residents in the areas of Bingiriya, Mahawa, Kobeigane, Nikaweratiya, Pallama, Arachikattuwa, Chilaw and Wariyapola have been asked to be vigilant of flooding.